Do you think that a grater is just for grating cheese? Well, that is just one of the many things in life that couldn’t be be farther from the truth in an Allergic Halal Foodie’s world. Chances are a dairy and nut allergic person will not even consider a grater to be useful. However, there are quite a few great allergy free foods to grate and I just wanted to spotlight a few. Chocolate. Grate some dairy-free and allergen free chocolate pieces over ice cream, dairy-free whipped cream, hot cocoa, or directly into your mouth and you won’t be disappointed. Only have chocolate powder in stock or don’t have the time to make a quick stop at the market for that tasty allergen-free chocolate? Don’t fret. You can easily make your own solid chocolate. Recipe is here. Bananas. Yes, you can grate bananas. Frozen bananas. A positive result of grated frozen bananas is dairy-free ice cream. When you grate the frozen bananas, top it with some of the chocolate you just grated, too. Veggies. Carrots, zucchini, beets are just a few of the vegetables that will be quickly cut and ready for consumption with a hand grater. Garlic. Instead of mincing this flavorful seasoning, try grating it. I have a garlic press which is also very helpful, but I personally always feel like a little bit of garlic remains in the garlic press compresses section and that always gets wasted. Try sticking the garlic clove with a fork and then grate without making your fingertips bleed. Nothing beats quick and fresh cut garlic and odor free fingers. Onions. This always helpful if you don’t have a food processor, tend to use fresh onions frequently, or if you just hate chopping onions. 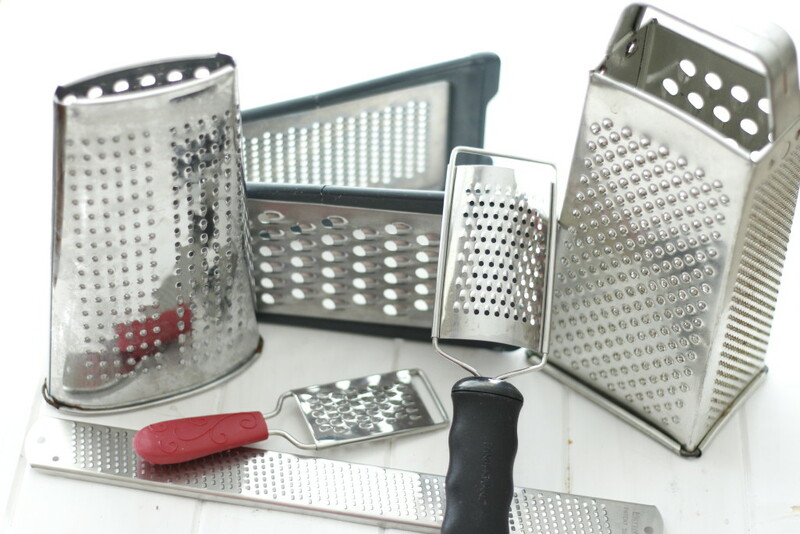 So go ahead and purchase a grater for that foodie in your life (maybe it is you). Touchless soap dispenser. This gadget is great for preventing cross contamination anywhere in the house. Cleaning hands is essential for food allergy safety and this type of soap dispenser eliminates that danger of spreading food allergens since one never needs to touch the pump to get soap. Spiralizer. I love how the presentation of something simple like carrots or zucchini is just that much heightened with this cool gadget. Allergic Halal Foodie paraphernalia. What other way to celebrate and acknowledge the Allergic Halal Foodie lifestyle other than announcing it with gear. Manual Food Chopper. This gadget is such a great and inexpensive kitchen tool if you have limited counter space or if you don’t have an electrical food processor. I do have an electric food processer, but I use this chopper for a variety of things, particularly for cutting perfectly shaped French Fries and diced onions. Restaurant gift certificate. There are several restaurants that offer gift certificates. 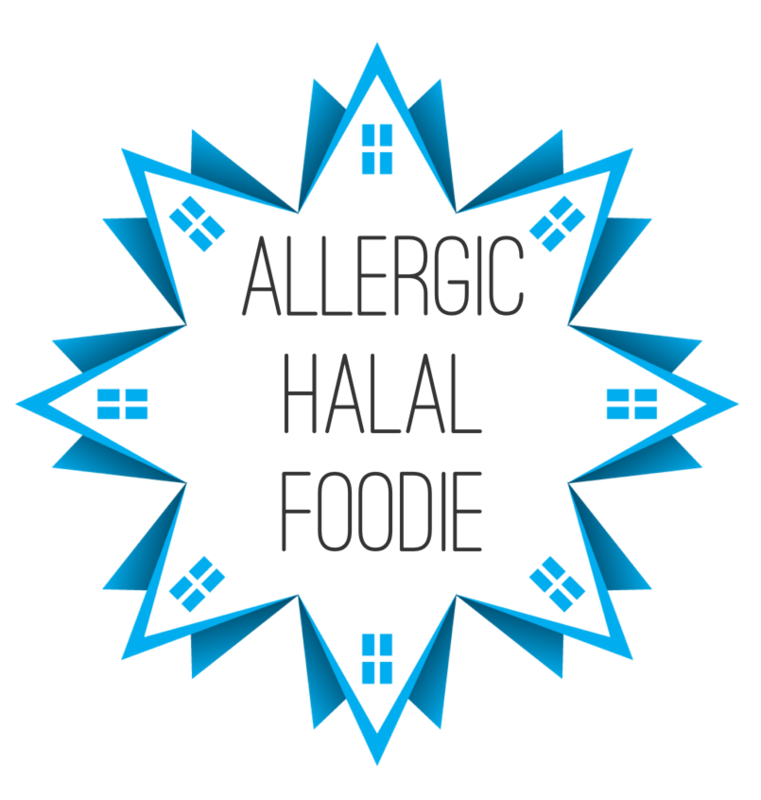 Check their menu online or make a telephone call beforehand to see what delectable food options your Allergic Halal Foodie can enjoy. One day I came home and found this lovely utensil set in my kitchen. 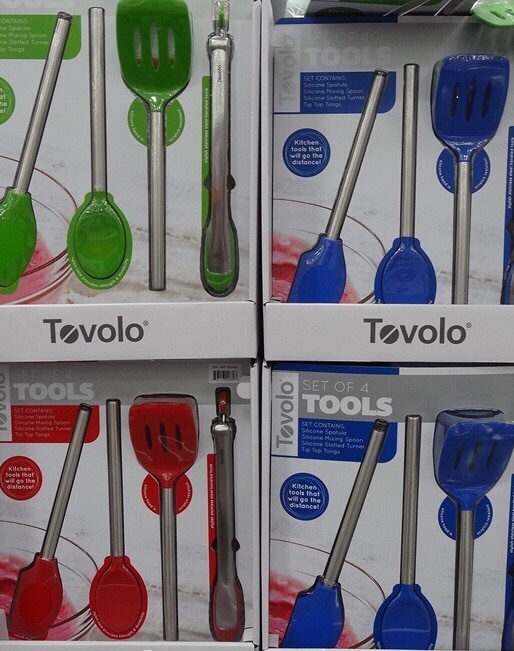 I absolutely love this set by Tovolo (mostly because it is so stylish with its vivid color, silicone head, and steel handle)! Although my husband, who doesn’t have any food allergies, purchased this set simply as a nice gift for me, I have come to really appreciate how this is a necessity in my allergic household. I love how it helps keep my cooking simple and cross-contamination free. He also bought me a professional grade silver utensil set by Tramontina that same day. Spoiled was I!!! If I am cooking two or more meals, some with allergens, I keep the utensil with color for the allergy-free meal (e.g., use a silver spatula for cooking crêpes with cow milk and eggs and use bright colored tongs or a spatula for cooking the dairy-free, egg-free French toast or pancakes) or vice versa. As long as you’re consistent, you can cook several types of dishes concurrently and remain free of any worries. I could see how someone would opt to buy multiple sets in a variety of colors and designate a color for each allergen (e.g., blue for dairy-free, green for nut-free, red for egg-free, etc). I haven’t chosen that route (nor do I intend to) because there simply isn’t a need. My mother always said “do what you can with what you have” and I have found that my system (one silver set and one brightly colored utensil set) works well for my household.